For the past decade, Bayer 04 Leverkusen striker Javier 'Chicharito' Hernandez has been delighting football fans all over the world with his goalscoring prowess. 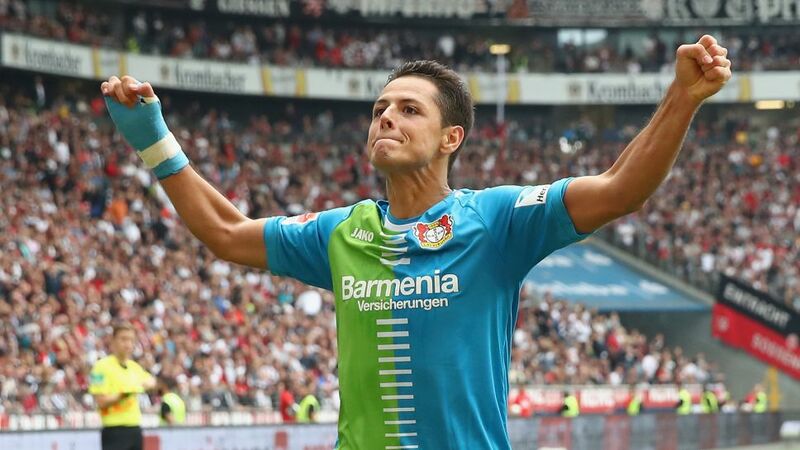 Want Chicharito for your Official Fantasy Bundesliga team? Click here! It all began in Mexico, where "The Little Pea" burst onto the scene as a teenager, helping his hometown club C.D. Guadalajara secure the Mexican Liga title in 2006/07. After playing for El Tri at the 2010 FIFA World Cup, Chicharito moved to Europe, enjoying successful spells with Manchester United FC and Real Madrid CF before joining Bundesliga outfit Leverkusen in the summer of 2015. In a wide-ranging interview with FIFA.com, Chicharito discusses his impressive career path, the demands of being a modern striker, and what sets the Bundesliga apart from the rest. The 28-year-old also touches on his current goal drought with Die Werkself and Mexico's chances of winning the 2018 FIFA World Cup. ... being a professional player for ten years. "It's been better than I ever dreamed it would be. My dream was to play in the first division and score a goal on my debut. I wanted to be a champion with the best club in Mexico, and I made that happen too. I pictured myself as being an important player for my club and making the national team, and I ended up winning the title, being the leading goalscorer and going to the FIFA World Cup in 2010. It's been amazing. It really has." ... keeping it in the family. "I went to Manchester United FC, where I won two Premier League titles and played in a UEFA Champions League final. Then came Real Madrid CF, and scoring the winner in the derby against Club Atlético de Madrid. Now I'm playing in Germany and I can't complain about anything." ... playing in the Bundesliga. "The Bundesliga always appealed to me a lot. It's a league that combines the best of both England and Spain. It's not as physical as the former or as attractive as the latter, but it's a mix of the two. And I have to say that they've treated me amazingly well. We finished third last year and even though we didn't start this season quite so well, we're right in the mix to be up there with the best." ... the tactical differences between the Premier League, Liga and Bundesliga. "They're very different, as are the teams I've played in, which means I've had to adapt. At Manchester we played 4-4-2 with two wide men who hit crosses into the box. The No. 9 wasn't expected to create the play and I had to become more of a finisher. It was totally different at Real Madrid. You get more time in Spanish football and you've got the freedom to try more things out. Here at Leverkusen the coach's philosophy is that we all have to win the ball back and do our bit in creating play. Good players have to work on all the attributes they have because you don't play how you want to play – you have to play for the team." ... his current goal drought [his last Bundesliga goal came on Matchday 6]. "I honestly don't let it bother me. I scored virtually a goal a game for ten years and I didn't think I was the best in the world then, just as I don't get depressed now because I haven't scored in a couple of months. What I like doing most of all is playing football. In these last few games I've had to work with the team in other positions, and I'm looking on it as a learning process so that I can become a more complete player, not just a finisher but someone who can play, take people on, turn and do different things." "Who doesn't like scoring? I think if you ask them, even 'keepers would like to get a goal or two. And that's what strikers get judged on after all. You can play badly but score a hat-trick and everyone congratulates you. I like coming off the pitch feeling that I've given my all. It might sound like a cliché, but what I want to do is help my team. If I score and we lose, then what's the point? Goals are the icing on the cake, the reward for all your hard work, and if you're playing well, then the goals will come. But if I'm playing badly and I'm not scoring, then I don't feel quite so happy." ... leading the line for Mexico. "It's great! The coach, Juan Carlos Osorio, is very adventurous in his approach. He likes to attack and he wants us to keep pushing forward the whole time. That boldness means he has a huge amount of confidence in the Mexico players and you can see that on the pitch, because he gives you a lot of freedom. He does a lot of preparation and he sets matches up in a way that allows us to be comfortable on the pitch and to play an attacking game." ... Mexico's chances of winning the 2018 FIFA World Cup. "I'm going to be very honest here: ever since I was a boy I've always believed that Mexico's time would come at each and every one of the World Cups they've played in. If everything goes as planned and we make it to the World Cup, I think we've got the talent to take that step forward, especially if we get the little bit of luck that we haven't had in the past." Click here for all the latest Bayer 04 Leverkusen team news!